While the funnyman enjoys success with QI and as a stand-up, Alan Davies' life hasn’t always been so sunny, as Amanda Riley discovers. Like so many comedians, Alan Davies comes across as serious, even gloomy. Today, the mop-haired, boyish 47-year-old lurches into our London studio wearing khaki cargo shorts, T-shirt – and trademark hangdog expression. Tired? Sulky? Hard to tell, but after our shoot (‘Could we have a smile, Alan?’ begs the photographer), the reason becomes clear, as he whips out his mobile phone to reveal a photo of two gorgeous toddlers, one with a mini mop of very fair hair, in what I take to be a paddling pool. ‘They’re in a washing basket in the garden,’ he helps me out, melting finally. His own childhood was deeply unhappy. His mother had leukaemia and he saw her in hospital a couple of times before his visits were stopped without explanation. He was six when she died, and he was not allowed to go to her funeral. He has said that the experience wrecked a large part of his life and he still thinks about his mother every day. By the age of eight, he was a shoplifter and a very troubled child. He spent a lot of time on his own and learnt to entertain himself, along the way becoming interested in comedy. Despite being ‘too dysfunctional to be the class clown’, he obviously had a gift, writing his own sitcom when he was 11 or 12. Despite his unhappiness he bagged eight O levels before moving on to Loughton College, where he discovered a talent for entertaining classmates with improvisations. He studied drama at the University of Kent, graduated in 1988 and performed his first stand-up gig at Whitstable Labour Club that year. Unsurprisingly, he was struggling with depression. He’s said that making a roomful of people laugh is a nice feeling, but doesn’t agree that being a comedian is a form of therapy. Nor did it dispel his demons. That was to come years later. ‘I got into comedy for the applause and the attention, but it wasn’t working for me,’ he has said, adding that his relationships too were ‘a dysfunctional mess’. She’s also an actress, very pretty and 12 years younger than him. He encouraged Katie to take a year off to write a book and The Great Hamster Massacre went on to win Waterstone’s Children’s Book Prize in 2010. They finally tied the knot when he was 40. 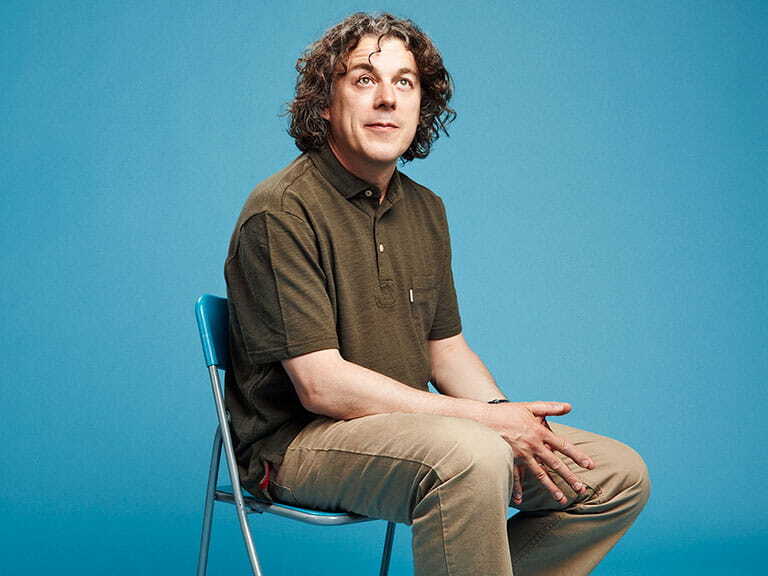 If he’s morphed into the world’s fondest husband and father, Alan Davies has also evolved into a national treasure, like his best man Bill Bailey and fellow comedy (and QI) legend Stephen Fry. His Life is Pain tour has been hugely successful; he’s the most watchable panellist on QI; and now he’s filming a new clutch of Jonathan Creek whodunnits. ‘There are going to be three 60-minute episodes – with a lot more of Sarah Alexander too – Sheridan Smith isn’t available.’ And next year he’s off on a tour of Australia with a new stand-up show. And how does he feel about getting older? ‘Well, I’ve got ailments and aches and pains!’ he quips instantly. He may be laid-back now, but one suspects it wouldn’t take too much for an angry fire to flare up again. The tabloids had a field day when he attacked a homeless man in 2007. Drunk and emotional after the funeral of his friend, Jonathan Creek producer Verity Lambert, he bit the ear of a homeless man who had been shouting abuse at him. Two years later, he got into another brawl that left him with a fractured cheek. Does he still get abuse from his nearly 600,000 online followers? Is he bothered about edging closer to the big 5-0? ‘It bothers me I’m nearer dying,’ he responds quickly. ‘I know what it’s like to be left too soon.’ But will he celebrate? ‘I’ll probably have a party for friends, and Katie and I want to go to New York, which is where we went on honeymoon’, he replies.